Fabriq is a relatively-new speaker brand. 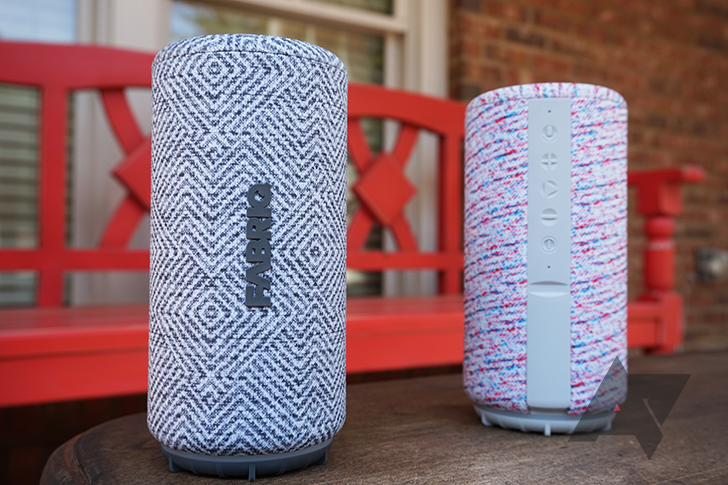 Its first product was the Fabriq RIFF, a speaker about the size of an Echo Dot, but covered with a soft fabric in a variety of patterns. 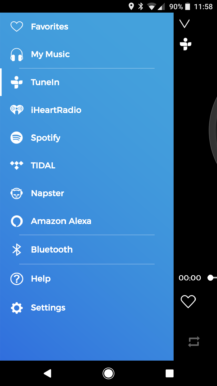 Not only did it have the Amazon Alexa voice assistant, but you could connect more than one for synced multi-speaker playback (like Google Cast/AirPlay). The Riff used either a direct microUSB connection for charging, or the included charging dock. 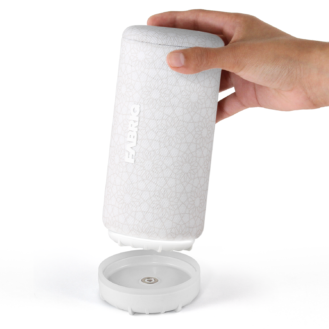 Today, Fabriq unveiled its second speaker, the Chorus. In most regards, it's a larger and more powerful version of the Riff, but with the added bonus of Alexa always-listening for commands (the Riff required a button press to activate Alexa). 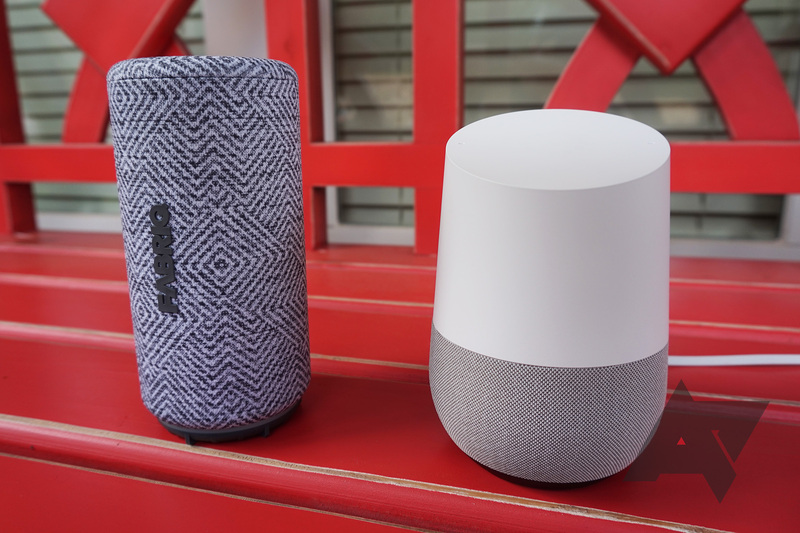 That makes it far more in line with products like the Amazon Echo and Google Home, especially considering the $99 price point. I think the Fabriq Chorus makes for a good speaker, but it does have a few issues. Dimensions 3.15" x 3.15" x 6.3"
Aesthetics You can't argue that Fabriq's speakers look unique. Battery The claim of six hours battery life seemed accurate in my testing. Sound Audio sounds very slightly muffled, and there's not much bass. Multi-speaker It only works with select services, and it's a bit buggy. Bluetooth You can't use Alexa while playing music through Bluetooth. The first thing you notice about the Chorus is its unique design. The entire body, save for the panel on the back and the bottom, is covered in a soft fabric. There are four patterns to choose from; I was sent 'Duke of Earl' (the black one) and 'Static' (the red stripped one). These patterns will be sold exclusively at Target, while 'Quartz' and 'Midnight Blue' will be sold by both Target and Amazon. 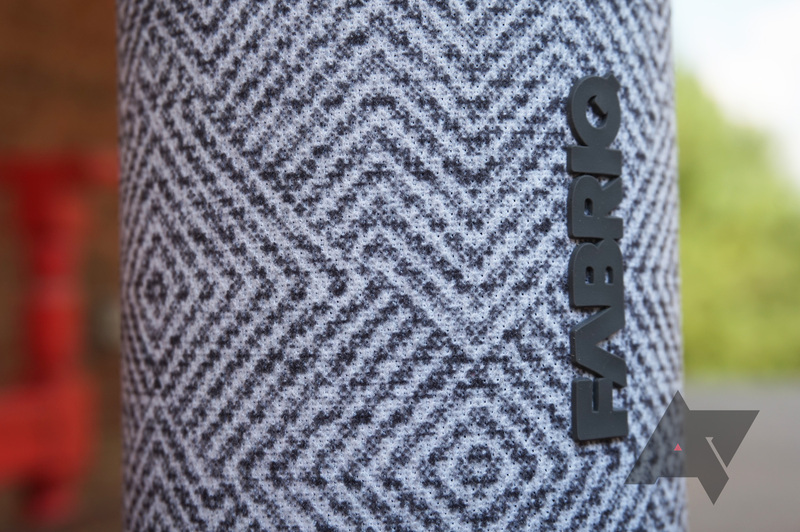 Fabriq says additional seasonal patterns will be available in the coming months. I imagine opinions about which color looks best/worst will vary greatly in the comments, but I'll say that out of the two models I was sent, I liked 'Duke of Earl' more. Whichever one you pick, it will certainly stand out in a room, if only because it's not a black slab of plastic. On the front is a vertical Fabriq logo, and on the back is a variety of controls and ports. There's a button for activating Alexa, turning the volume up, controlling playback, turning the volume down, and turning it off/on. Near the bottom is a rubber flap, with a few more controls underneath. There's a reset button, a switch for Alexa/Bluetooth (more on that later), a button to disable microphone input, and a microUSB port for charging. You have two options when it comes to charging the Chorus. You can use the above-mentioned microUSB port, or set it on top of the charging pad. The pad also uses microUSB, so if a cable or wall adapter breaks/stops working, you won't have to get a new dock. I personally would have liked to see USB Type-C on both the dock and speaker, but I realize that most people would prefer to use a more common connector like microUSB. There's also no line in or line out. On the bottom is an LED ring, which changes color based on what you're doing. It turns white when booting up/switching to Alexa, blue when switching to Bluetooth, red when the battery is low, and green when the battery is full. 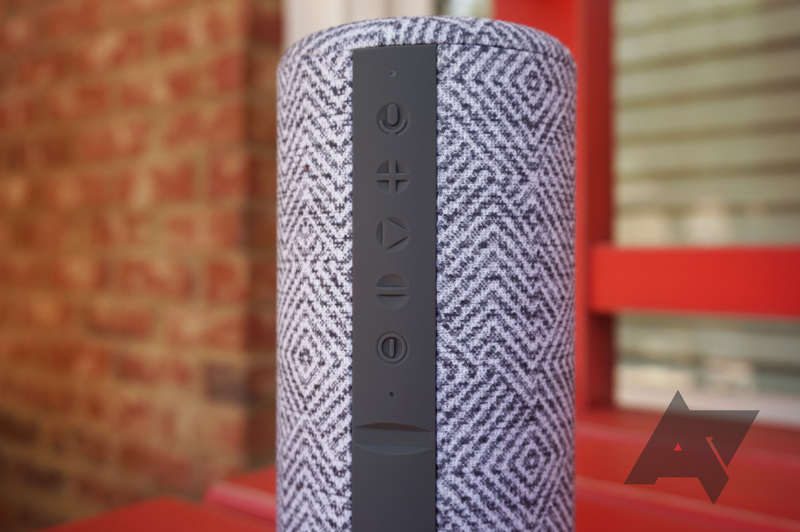 When you're talking to Alexa, there's a swirling blue animation, much like when talking to Alexa on an Echo or Echo Dot. As far as build quality goes, the Chorus feels sturdy, but it's not advertised as being durable or waterpoof. 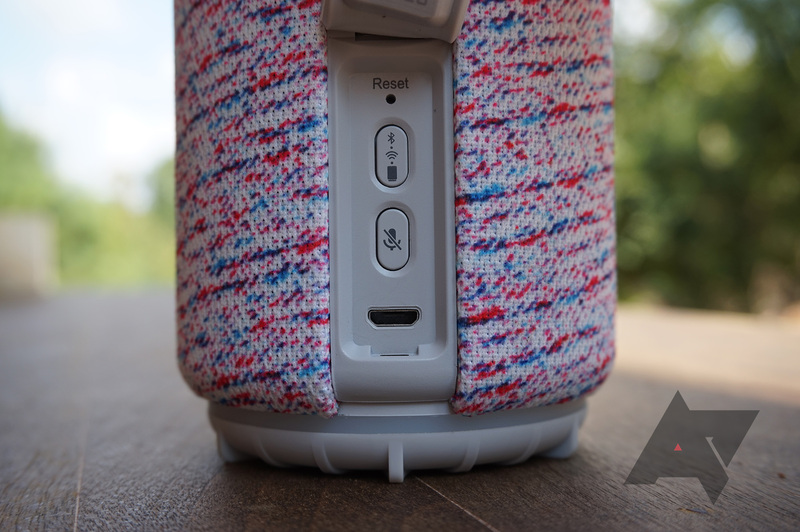 So if you're planning a beach trip or a pool day, you should definitely pack a different speaker. 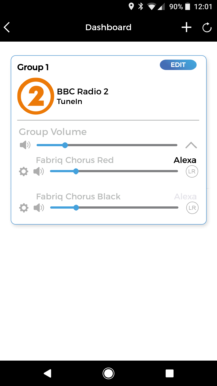 The Chorus is first and foremost an Alexa speaker. You can check the weather, order a pizza, start music, and much more - all with your voice. The speaker listens for the "Alexa" hotword, so unlike the Fabriq Riff, you don't have to press a button before you start talking. It didn't have any problems picking up my voice, even from the other side of the room while talking in a low tone. 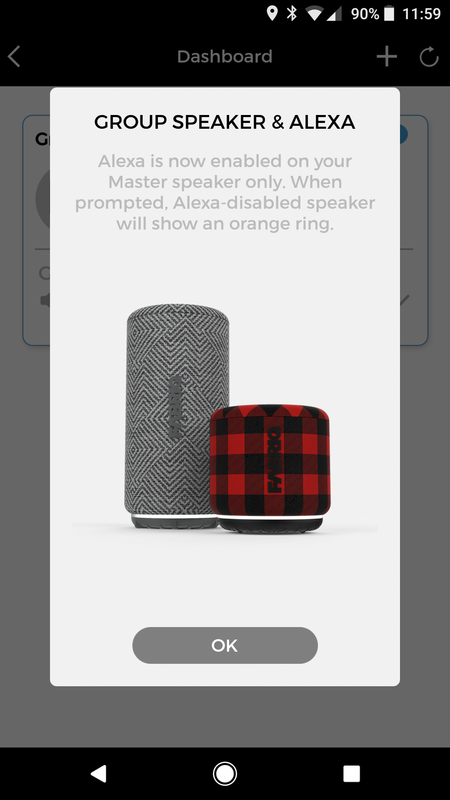 Amazon periodically introduces new features in Alexa that have to be implemented by the device manufacturer, like multi-room music playback and reminders/named timers. I tried both of these features on the Fabriq, and they weren't supported at the time of writing. So if you want to try out the latest and greatest Alexa has to offer, you might be disappointed. 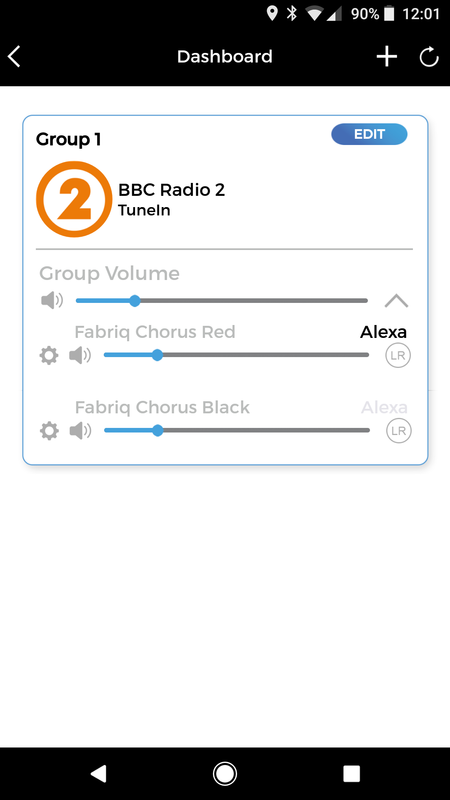 In addition to playing music straight through Alexa, you can use Bluetooth or the Fabriq app (more details on that later). There is one huge limitation to this speaker when it comes to Bluetooth and Alexa; you can only use one or the other at the same time. Unlike the Google Home and Amazon's Echo speakers, the smart assistant is completely switched off when you're using Bluetooth. If you want to go back to Alexa, you have to press the Alexa/Bluetooth switch on the back. That limitation aside, I found that the Chorus worked fine as a Bluetooth speaker. Sound quality was good, and the maximum range seemed to be around 10 feet with the devices I tried. I encountered stuttering problems when paired to my Chromebook, but considering that's the only device I had issues with, the speaker probably isn't to blame. The third way to play music on the Chorus is with the Fabriq app, which supports TuneIn, iHeartRadio, Spotify, Tidal, and Napster. 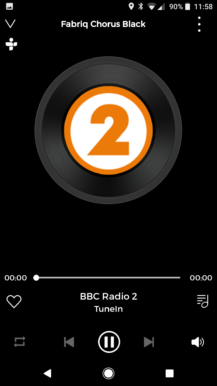 You can also play locally-stored music from your phone/tablet. This is where the multi-speaker playback comes in. 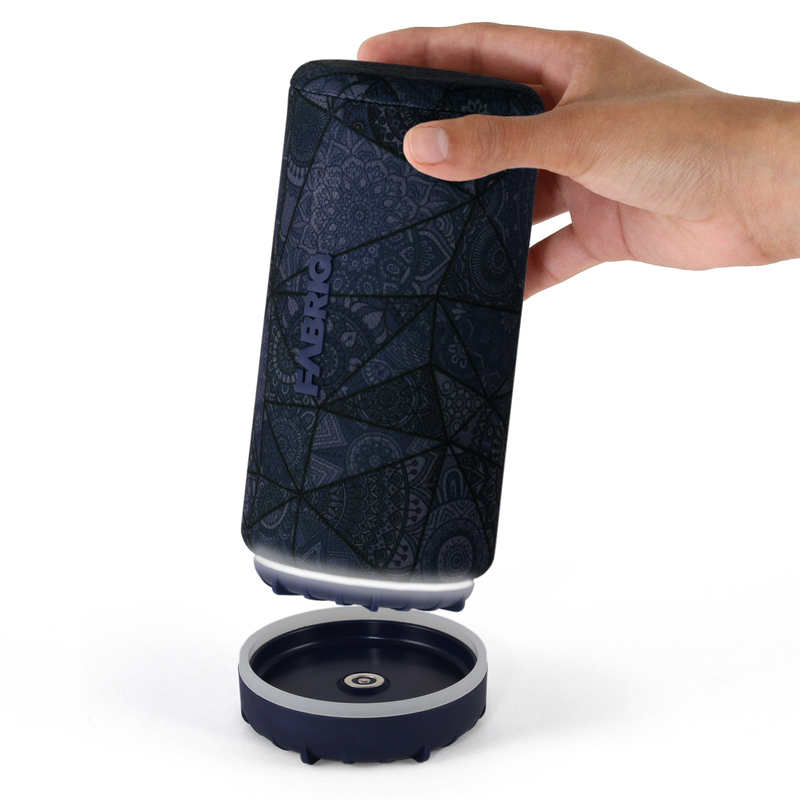 You can group together Fabriq speakers and use any of the included services with multi-room. Once you create a group, anything you select will play through all the speakers in the group. I didn't really have issues with Fabriq's multi-speaker setup, besides trying to un-group certain units. 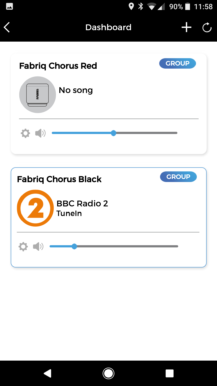 Instead of having a button that turns off multi-speaker playback, you have to tap the Edit button on the group and remove speakers individually. During this process, the app sometimes got stuck and I had to try again. It's not the most seamless solution in the world, but at least there are a good number of supported services. Of course, what good is a speaker if the sound quality is bad? In general, I would say the Fabriq Chorus is a decent speaker. The bass is somewhat responsive, but there's not much of a 'boom.' The Chorus can get pretty pretty loud, and even at higher volumes, I didn't notice any distortion. The only other issue I noticed is that music sounds slightly muffled (maybe due to the fabric covering, but I'm just making guesses). Honestly, I don't think most people would mind, or even notice it. Despite the round shape, it's worth noting that this not a multi-directional speaker. Music sounds best when the Chorus is pointed right at you (with the logo facing in your direction). Overall, I think the average buyer won't have any complaints with the sound quality, especially considering the speaker's size. As far as battery life goes, Fabriq estimates about six hours of playback with the unit's 2,200mAh battery. In my testing, that claim seems to hold up. I tended to keep it around 50-75% volume, and I didn't notice a difference in battery life between the Bluetooth and Alexa modes. 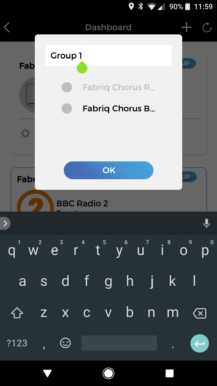 Overall, I liked using the Fabriq Chorus. The patterns make it stand out in a crowd of black and metal speakers, and the charging pad makes it even more convenient to pick up and take with you. 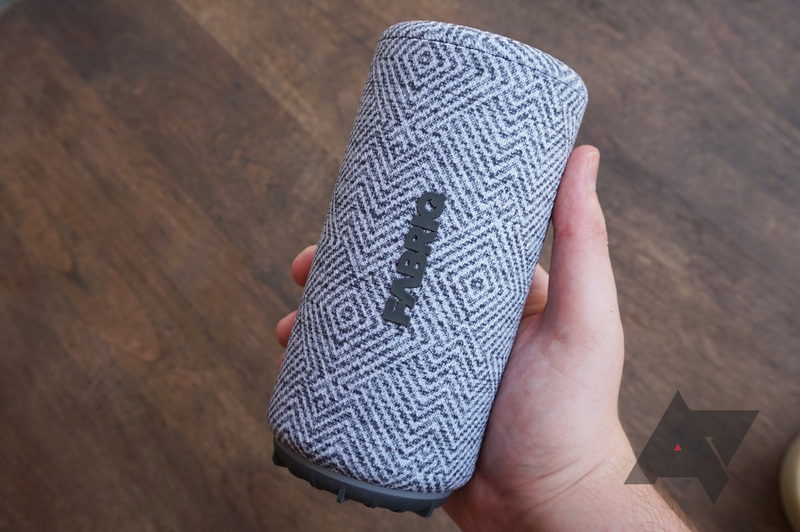 Alexa is great to have, but even when you're without an internet connection, the Chorus makes a good Bluetooth speaker. Having to switch between Bluetooth and Alexa is a bit annoying, but it's far from a deal-breaker. 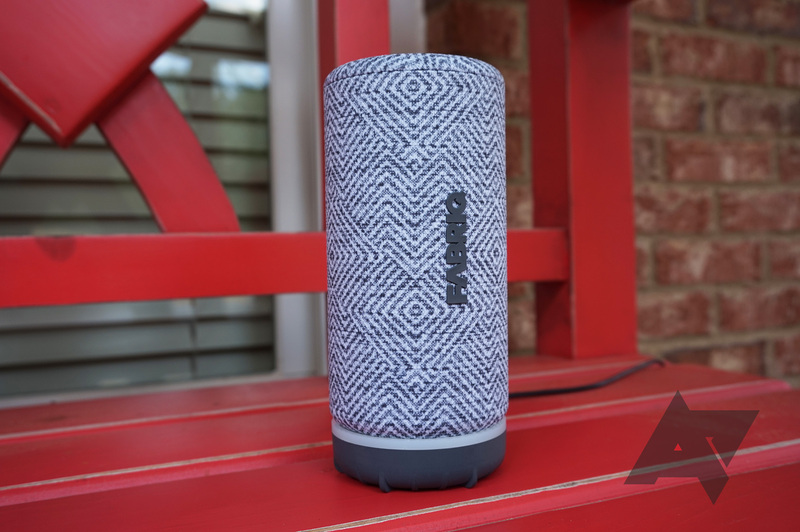 If you want a cool-looking Alexa speaker that works equally well at your bed-stand as it does in the park (as long as it's not raining), I think the Fabriq Chorus is a compelling product for $99.